Helping the "Building Green" revolution of energy savings for the planet and the pocket. See U.S. Government "Green Home" building programs. Serving Metro Atlanta and the Southeast U.S.
Air Changes per Hour (ACH); An expression of ventilation rates - the number of times in an hour that a home's entire air volume is exchanged with outside air. 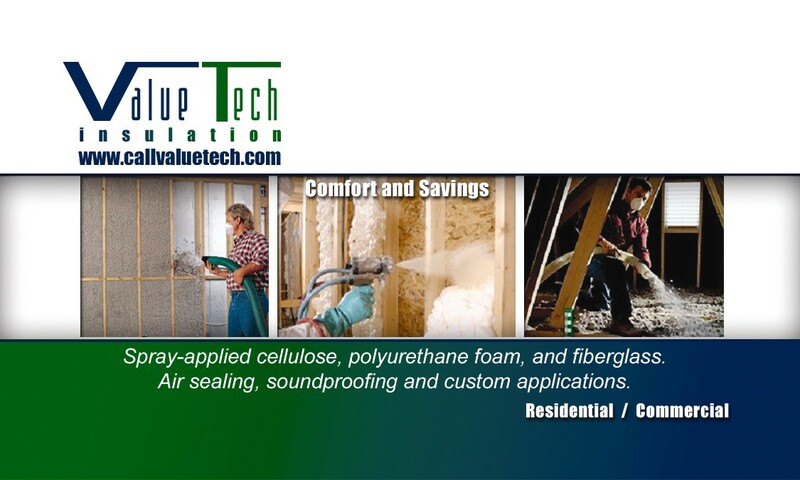 Air barrier; A layer of material resistant to air flow usually in the form of polyolefin (i.e. Typar, Tyvek, and other housewraps). A material which is applied in conjunction with a building component (such as a wall, ceiling or sill plate) to prevent the movement of air through that component. Air barrier system; The assembly of components used in building construction to create a plane of air tightness throughout the building envelope and to control air leakage. Learn more about Air Barriers. Blower Door; Diagnostic equipment consisting of a fan, removable panel and gauges, used to measure and locate air leaks. Blowing agent; A gas or a substance capable of producing a gas used in making foamed materials. Building Envelope; The external elements walls, floor, ceiling, roof, windows and doors of a building that encloses conditioned space; the building shell. Conduction; Transmission of energy (heat /sound) through a material or from one material to another by direct contact. Materials with low rates of conductive heat transfer make good insulation. Convection; Transmission of energy (heat /sound) from one place to another by movement of a fluid such as air or water. Cream Time; Cream time is the time from when the two foam componnets (A & B) are mixed unitl the first sign of an increase in volume occurs. This time for spray systems is usually five to ten (5 to 10 ) seconds. Density; Determined by the weight expressed in pounds of a cubic foot of any material. Foams are described in terms of their density. Density describes how much one cubic foot of foam weighs. Dew Point; The temperature at which a vapor begins to condense. Exfiltration; Uncontrolled leakage of conditioned air from inside the home to the outside. Flame Retardant; A substance, which is added to a polymer formulation to reduce or retard the tendency to burn. Flame Retarded (Adj. ); The property of a material to which flame-retardant has been added. Flame Spread; Unit of measure generated by a standard test for determining relative combustibility. The flame spread of a tested material is rated relative to red oak (flame spread = 100). ASTM = E84 is the test method used to determine the above. Flammability; Relative ability of a material to support combustion as expressed by its flash point. Heat loss; Heat that is lost from a building by air leakage, conduction, and radiation. To maintain a steady interior temperature, heat losses must be offset by a combination of heat gains and heat contributed by a heating system. Heat recovery ventilation system; A mechanical ventilation system that recovers energy from exhausted indoor air and transfers it to incoming air. This system usually incorporates an air-to-air heat exchanger which transfers the heat from exhaust air to the incoming air or vice versa. Humidistat; A humidity sensitive control device that signals the ventilation system to operate if the humidity goes above a preset limit. Hydrophobic; Having no affinity for water; not compatible with water. "Water fearing" Also preventing growth of mold and mildew. Infiltration; Uncontrolled leakage of air into a building through cracks around doors, windows, electrical outlets and at structural joints. Uncontrolled leakage of conditioned air from outside of the home to the inside. Insulation; Materials with low thermal conductivity characteristics that are used to slow the rate of heat transfer..
Isocyanate (typically MDI); One of a group of neutral derivatives of primary amines (R-N=C=O) groups. An essential component (A) of urethane foam chemistry. Material Safety Data Sheet (MSDS); A standard formatted information sheet, prepared by a material manufacturer, describing the potential hazards, some physical properties, and procedures for safe use of a material. Mold; Fungal growths often resulting in deterioration of organic materials, especially under damp conditions. 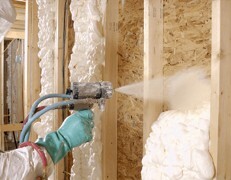 Overspray; (1) Airborne particle loss of polyurethane foam in spray application. (2) Undesirable depositions of airborne spray loss. Perm; A unit of water vapor transmission defined as 1 grain of water vapor per square foot per hour per inch of mercury pressure difference (1 inch mercury = 0.49 psi). Metric unit of measure is ng/m2 s Pa. 1 perm = 55 ng/m2 s Pa.
Pressurized Fog Testing; Done in conjunction with a blower door test, presurized fog test visually identifies air leaks in a building's envelope. The test is usually done when temperature and weather conditions make an infrared scan difficult. Product Data Sheet; A listing of all the general characteristics and components of a chemical or product. (Also see MSDS). Radiation; Transfer of energy (heat/sound) from one object to another through an intermediate space. Only the object receiving the radiation, not the space is heated. The heat is in the form of low frequency, infrared, invisible, light energy, transferring from a "warm" object to a "cold" object. It is known as the "black body effect". Relative Humidity; The ratio expressed as a percentage of the amount of moisture air actually contains to the maximum amount it could contain at that temperature. Resin; Component B in urethane foam chemistry. This component is mixed with the A component to form foam insulation. 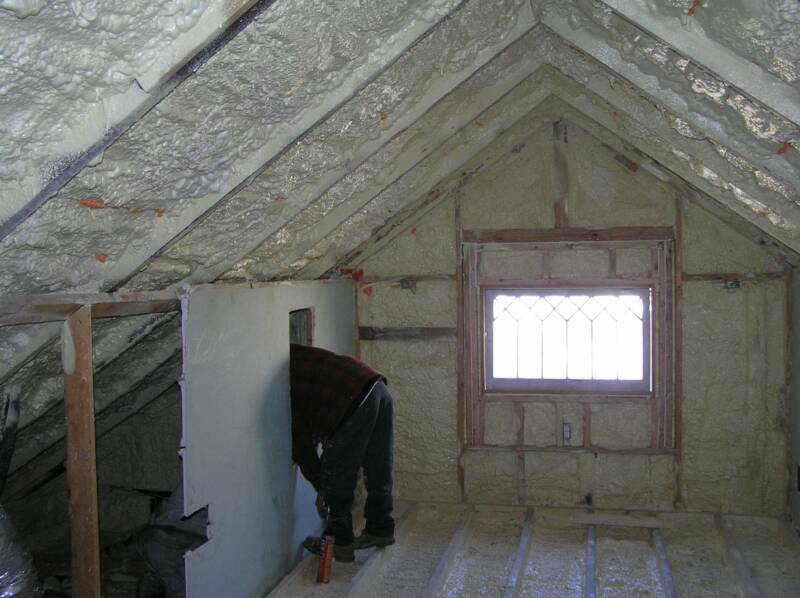 Superinsulation; The word was coined during the energy crisis of the 70's it is an approach to solving thermal envelope problems. Superinsulation is usually, but not always, one of the several urethane foam systems. Thermal Barrier; A material applied over insulation designed to slow the temperature rise of the foam during a fire situation and delay its involvement in the fire. Thermal Bridge; A thermally conductive material which penetrates or bypasses an insulation system; such as a metal fastener or stud. More about Thermal Bridging / Breaks. Thermography (Infrared Scan); A building energy diagnostic technique using an infrared camera for locating areas of temperature differential or air leakage in a building. Often used in conjunction with pressurization or depressurization. Vapor Retarder/Barrier; A layer of moisture resistant material usually which controls moisture diffusion (defined as less than 1 perm in typical building environments) to prevent moisture migration into building cavities.